This Sunday, March 30th, 2014, marks the 81st National Doctors’ Day in the USA. 180 Medical wishes to recognize and honor the significance of this day and honor the many special urologists, rehabilitation doctors, general practitioners, and other physicians that we are proud to know and serve. The very first Doctors’ Day to be observed on record was March 30th, 1933, when Eudora Brown Almond, wife of Dr. Charles B. Almond, created and implemented a day solely to honor physicians. On this first observance in 1933, greeting cards were mailed, and many also placed flowers on the graves of deceased doctors. 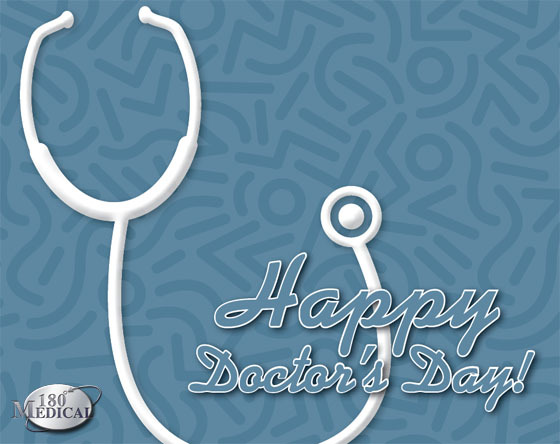 In 1990, National Doctors’ Day was signed into public laws to designate March 30th of every year as the official day to recognize physicians and their many contributions to learning, teaching, healing, and changing lives. To all of the great physicians out there, today, all of us at 180 Medical would like to thank you for all that you do every day, you strive diligently to improve the quality of life for others. The great care you demonstrate in your work does not go unnoticed by us. National Doctors’ Day is just one day out of the year, but our gratitude for you is year-round!